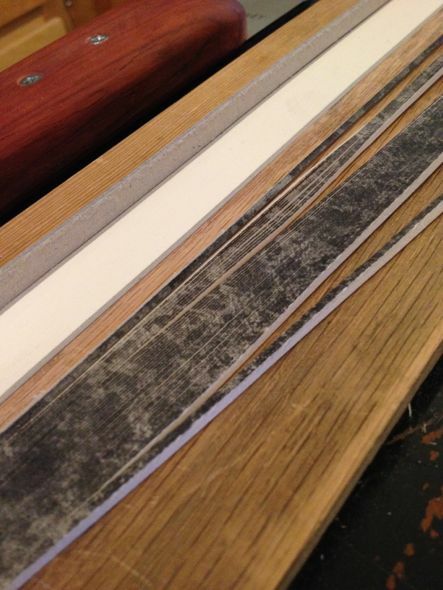 A smooth, well-cut edge is a functional and design aspect crucial to many styles of bookbinding. Historically it has served to differentiate between a what are often considered permanent and temporary binding styles. A cut edge can be left alone or form a basis for further edge treatments: coloring, paste-decoration, guilding, and gauffering. Many bookbinders do not have a massive guillotine or a reliable plough. Artist Tim Ely has been using a round French or Swiss style knife for some time to precisely cut edges. He grew increasingly frustrated at the edge retention of commonly available knives, and found the handle interfered with this different use of the knife. For the past year or so, we have been exchanging ideas and at this point I am pleased to announce The Ely Edge Knife is available for sale. The Ely Edge Knife. Top knife with Mahogany handle, bottom New York State Cherry. For anyone that has taken one of Tim’s fantastic workshops, you will likely recognize the shape that he came up with. 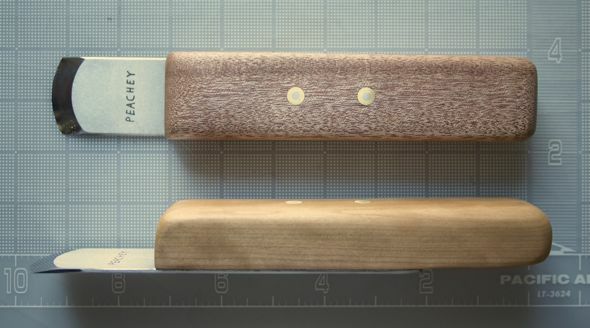 The top mounted hardwood handle is roughly 7 inches long, 1.5 inches wide and 1 inch in thickness. It is attached by epoxy and screws to the blade, made from the same A2 steel I use for my French and Swiss knives. The size of the handle makes it easy to grip using both hands. I find that by using your dominant hand near the cutting edge, and pushing with your other, it is possible to get a very clean cut, as shown in the image from Tim Ely below. A perfectly cut edge, trimming off previous edge decoration. Photo by Tim Ely. Because of the hand control on the knife, there is less of a tendency to take too big of a “bite” which can often happen with a plough. It forces you to think and feel the cutting action a bit more, rather than just run the plough back and forth. I have to admit I was a bit skeptical when Tim first told me about this method a number of years ago, and since I have a couple of well functioning ploughs didn’t try it until last year. The edges I’ve done are equal, if not better, than my ploughed edges. An experimental knife made with multiple blade bevel angles. One thing I noticed is that the blade angle is not as critical as it is for paring leather. This round blade cuts basically as well from 13-26 degrees. In fact, I would guess a steeper angle results in even better edge retention, and many plough blades are in the 25 degree range. The knife I now sell comes with a 13 degree angle, so it can be stropped into shape for quite some time and perform well, even as the angle becomes more obtuse. The round shape of the blade also has the advantage of providing a variety of sharp areas to use, rather than just dulling a single pointed tip. It also provides a nearly zero effective blade angle in use, which Tom Conroy discusses and illustrates in his article “The Round Plough” in The Abbey Newsletter, Vol. 13, No. 3, June 1989. This allows the blade to perform at a lower effective blade angle than it actually is, so it is actually sharper. Hasluck’s carriage for a chisel from 1912. Conroy briefly mentions two earlier uses of a freehand round knife for edge cutting in his footnotes. 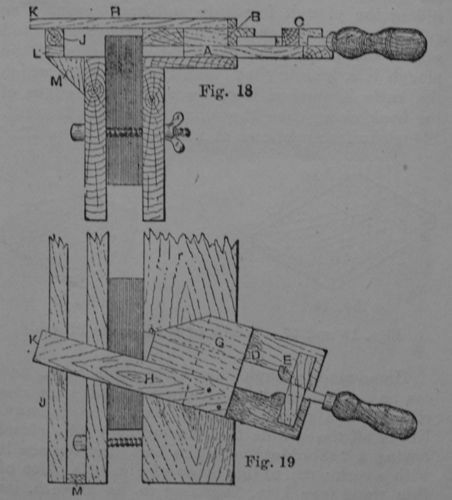 Paul Hasluck’s 1912 Bookbinding contains measured drawings of a wood carriage that holds a chisel or plane bade. Hasluck’s design seems needlessly complex, is more like a hand advanced plough, and quite limited in terms of the thickness of the book that can be cut. Also it is only cutting using one edge which would dull rapidly. Handheld ploughs are also related to the odd looking Dryad version I previously wrote about. Unsuccessful handle and blade shapes. I thought these larger and heavier grips would aid holding and driving the knife, but instead they create instability. A few concerns, though. When using this knife, it is necessary to have a dead flat press cheek, at least the one the knife rides on. I also doubt this knife should be used for cutting in-boards, since modern binders board is so abrasive. 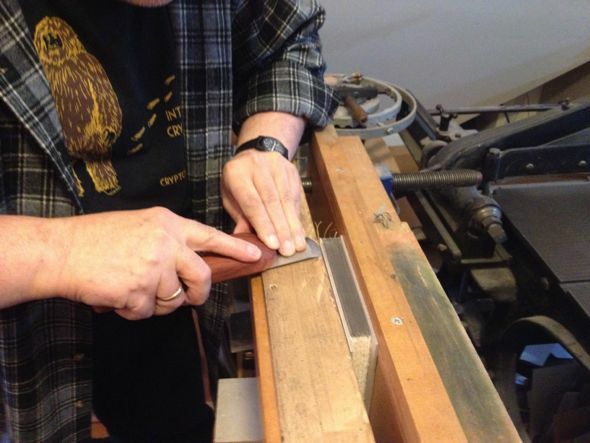 When resharpening, it is best to treat this knife like a plough blade: concentrate your work on the bevel (since the back arrives flat and sharpened) and just clean off the burr at the end on the back, since it should be kept flat or it will want to ride up on the text block as you are using it. Tim using the knife. He is pushing into the text with his right hand and using his left to control and guide the knife, pulling it towards himself. Best results are achieved by slicing only a leaf or two at a time. Photo by Rich Spelker. I would also like thank Tim Ely for providing the specifications of this knife, and more importantly, for being my first bookbinding teacher. Without his encouragement who knows if I would have even ended up in this field. It is an honor to be able to work with a former teacher. The Ely Edge Knife. Overall length 9-9.5 inches, 1.5 inches wide. Top mounted hardwood handle 7 inches long. The blade is A2 steel, Rc 63, 13 degree single bevel. 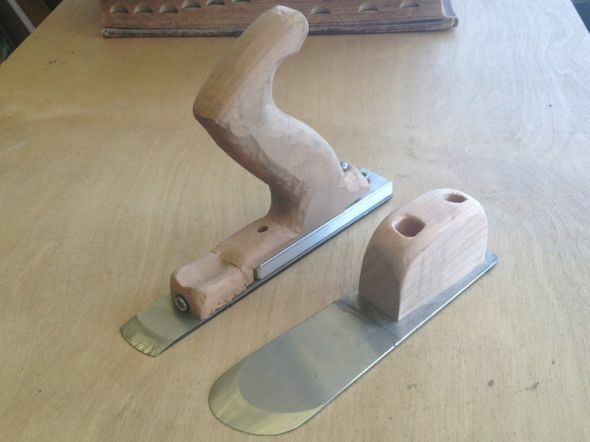 I love hand-crafted tools, these look fantastic. I think the exposed part of the blade looks a little small, especially for someone like me with rather ‘chubby’ fingers. I think a longer blade might also help with books with large text blocks? I would be interested in hearing your feedback if you could spare a couple of minutes? I’ll look into featuring these on our website iBookBinding shortly (http://www.ibookbinding.com), see if we can’t push a few more sales your way. I’ve found it comfortable but am always interested to hear feedback. I’d encourage you to actually try one, and I’m happy to made custom version. 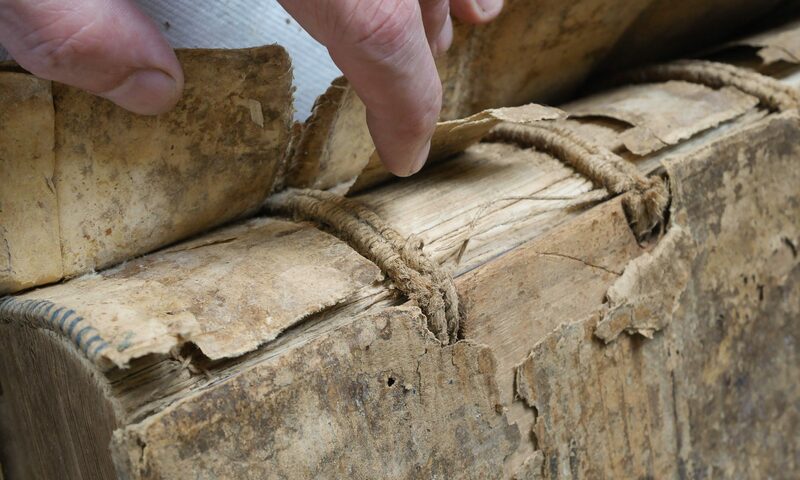 As the knife cuts, it actually rides across the text block, and that portion is removed, so it does’t really matter how thin or thick the book it. I’ve done books up to 3 inches, but thicker than that might be difficult depending on how thick the cheeks of your press are. A longer handle would help, but then throw off the balance for thinner books. It is necessary to have your fingers pretty close to the cutting edge to keep the blade from riding up. Thanks for the reply Jeff and clarification. What about a design where you could have an adjustable blade length by use of a fly nut near the front edge and a mitred joint at the base of the handle for the back fixing to slide into? If I get the time I’ll draw up some designs and send them over to you, if not for any other reason than for entertainment :-D.
Thanks again for the reply, I’ll see how my money situation is at the end of the month and then maybe I’ll buy one off you! Yes, it’s hard to imagine I know. I’ll see if I can get a design draw up and send it through. In the meantime, would you mind if I used a couple of the photographs on this page to do a post on the tools you make for inclusion as a post on our site (credited of course)? Also, do you have a link where people can purchase your tools from so I can forward our visitors to the correct place?